Wyndham Hotels and Resorts has opened Wyndham Dreamland Resort Bali, its second resort on the popular Indonesian holiday island. The upscale 177-room resort is located near Dreamland Beach, one of Bali’s most idyllic hidden coves. Living up to its name, the beach is framed by dramatic limestone cliffs that hug the rugged coastline of the southern Bukit Peninsula. It is characterised by glorious stretches of white sand, breathtaking sunsets and some of Bali’s most iconic surf breaks. 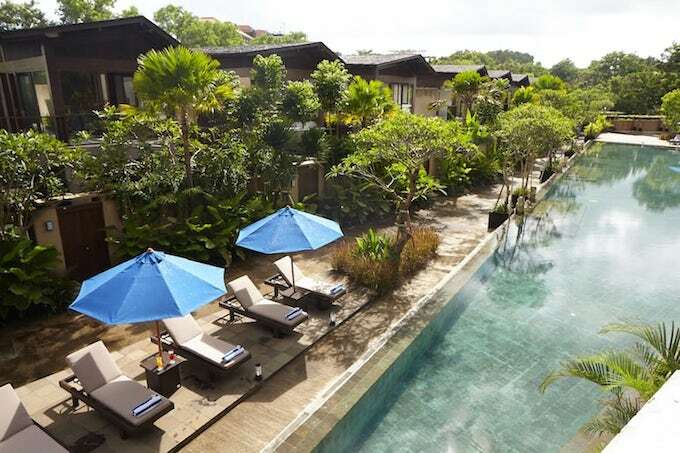 The 177-room Wyndham Dreamland Bali, owned by PT Accolades Lakshmi Resort, is Wyndham Hotel Group’s sixth location on the island, joining Ramada Bali Sunset Road Kuta, Wyndham Tamansari Jivva Resort Bali, Wyndham Garden Kuta Beach Bali, Ramada Bintang Bali Resort and Ramada Encore Bali Seminyak. Barry Robinson, president and managing director of Wyndham Hotel Group South East Asia and Pacific Rim, said: “The opening of our sixth hotel in Bali underscores Wyndham’s commitment to growing our footprint in sought-after locations. Wyndham Dreamland Bali is ideally located among an exclusive collection of beach clubs, an award-winning golf course and just a minute’s walk from the white sands of Dreamland Beach, which is home to bustling beach clubs and local cafés. Opposite the resort, the award-winning New Kuta Golf Course offers golfers an 18-hole links-styled fairway terrain overlooking panoramic views of the Indian Ocean. The property will feature a striking fusion of traditional Balinese and modern design across 177 rooms that encompass seven spacious room categories. Each stylishly designed Deluxe Room offers 36 square metres of space with king or twin beds, working desks and a plush chaise lounge for guests to recline on and enjoy the garden views. The larger 72 square metre suites offer extended living areas and deep soaking bathtubs as well as outdoor Jacuzzis in ground level units. The resort’s eight luxurious villas, with one or two bedrooms, boast private swimming pools in a lush natural setting and are perfect for honeymooners or families looking for a lavish retreat. The resort’s facilities include three food and beverage outlets, two outdoor swimming pools, and Tirta Spa, a complex with a total of six single and couple treatment rooms, plus a yoga deck.